He would have turned 100 yesterday. He did make it to 97 - in good health, marbles intact, with his lovely wife and family by his side. 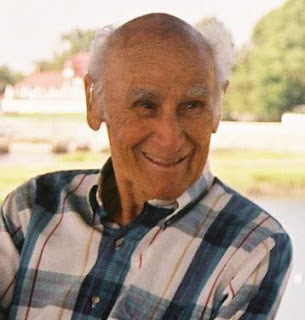 Herman Simon was born on February 25, 1913, the eldest son of immigrants who arrived in the United States via Ellis Island. He was raised in Union City, New Jersey along with Raymond (Dad! 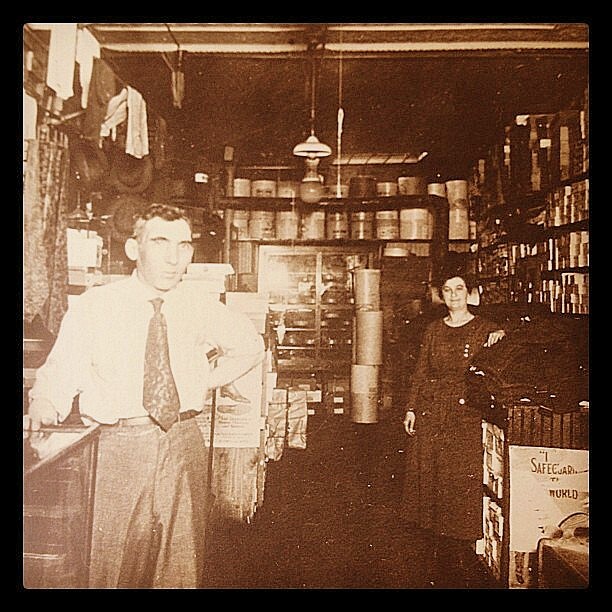 ), Morris and kid sister Lillian above the Simon haberdashery. His inauspicious beginnings formed the content of his character and his lifelong work. He grew up during the Great Depression in cramped, modest quarters. He realized early on that he had a way of connecting with and helping others, and had that special ability to ignore those who told him something couldn't be done. He liked to root for the underdog, because often he was the underdog. As a camp counselor (which is how he met my amazing Aunt Yvette), he was a natural leader. Later, as a camp owner and international travel guide, he was a natural leader. As a school administrator in a vast and complicated system, he was a natural leader. As a tireless advocate for the elimination of acid rain in the Adirondacks, he was a natural leader. I cannot adequately express the difference this great, larger-than-life man made in the lives of so many thousands of people. He never knew a stranger. He inspired others, giving them the courage to do what they previously thought was impossible. To me, he was so much more than an uncle. He was a lifelong mentor. We were lucky enough to spend lots of time with Hermey and Yvette, soaking in the beauty of the Adirondacks during summer visits to their quirky old home in Schroon Lake and catching my first fish. In the fall and winter, we'd head to their A-frame in the woods of New City for Thanksgiving gatherings, day trips to the city for Broadway shows, and afternoons of skating on the frozen pond. Then, there was the delicious simplicity of sunsets enjoyed from their balcony in Pompano Beach. Amidst the jumble of the many shared adventures of concerts, plays, hikes, swims, cooking marathons and big parties, I like to sift out the quiet moments. Those profound insights, advice, ideas, wisdom and stories Uncle Hermey would share when we were taking in a sunset from the balcony, or the murmur of bullfrogs from the gazebo overlooking the pond. When Herman Simon left us in the summer of 2010, a star went dark in the sky, creating a void in the lives he touched. He accomplished so much, had an extraordinary and loving 70-plus year marriage, traveled the globe with Aunt Yvette, and left the world a better place. But I still miss him. Aunt Yvette is wiser than I am, though - she smiles and says, "We did it all! That's what matters." It comforts me to know that I will always carry a part of him in my heart. I hope I'll always be able to tap into that part of my heart when I want to do something good, generous or impossible. Love and miss you, Uncle Hermey! Here's to your 100th birthday! The craft beer rage is at fever pitch. Draft Magazine reports that 2,000 craft breweries are operating in the US today, and it looks like Americans just can't get enough of small-batch, high quality brews. I think part of this is the coolness factor to beer literacy, but also with gastronomy being where it is today, more exotic dishes lead to more discriminating palates. Here in the Buffalo Bayou region, we're proud of our local suds. We checked out an event recently at the Buffalo Bayou Brewing Company, a new-ish company housed in a warehouse in the middle of a Heights neighborhood. The event was centered around the launch of a food trailer (always a cause for celebration), and was made positively festive by live music. If you ask what 1836 stands for, we'll ask you to put down our beer and leave our country. Do you have local breweries you visit and tour? What makes them special for you? Houston is a city where you can get up-close and personal with some exceptional art created by brilliant talent from all over the world. Consider the gallery of Wade Wilson. He has a keen eye for talent, and especially for artists who are adept at large-scale works filled with rich layering, texture and dimension. Any opening there is a guaranteed hit, because there will always be a piece or five which speak to you. Oh, and the people who attend the events are also colorful and engaging. Recently we checked out a multi-artist show, and this gallery continues to feature serious artistic merit. Hans de Bruijn, a conceptual expressionist, was trained at the Royal Arts Academy in The Hague. He does wonders with juxtaposed positive and negative images, with layers upon layers of paint. I found his work to be playfully abstract yet architectural, and his brushstrokes lush and seductive. Thomas Glass loves the art of collage, and reminds me a little of Picasso plus Miro plus Cezanne. His works are huge riots of color, with plenty of little surprises to keep you absorbed in studying his work. Houston boasts dozens of art galleries in its thriving art community. Get out and put yourself in the middle of it - you'll be glad you did. Pin It Now! Sometimes, you pass by a place for a few months or a year, and just don't go inside even though you have heard good things about it. Sometimes, you find yourself in that place in an unplanned but happy accident. That's what happened the other night. A Houston franchise of the Piola founded in Italy and owned by Florence's own Michele Cencini, Midtown's Piola is an unassuming little pizza and pasta spot characterized by an explosion of colorful lighting and a welcoming garlicky air. Of course, there's less competition here for Italian food than there is in Italy, so that helps. But that smell is so welcoming. We found ourselves there as accidental tourists, and we were pleasantly surprised. Not only is the menu huge, but it's reasonably priced and includes a number of ingredients flown over directly from The Mother Country. Portions are more than generous - three of us couldn't finish three plates. The Roka Cabana insalate featured arugula, mozzarella, diced tomatoes and bell peppers, pistachios and pomegranate dressing. It was light and fresh with a citrusy hint, though I would probably try another salad next time as the texture wasn't quite what I imagined. And the pizza, wow. There are dozens to choose from, and we tried the Prato with sauteed shitake mushrooms, arugula and shaved Grana Padano. The crust was crispy and thin, and the tomato sauce was so zesty and fresh. A little olive oil and pepper on top made this one of the most delicious pizzas ever! If you're looking to bring back memories of a trip to Italy, practice your Italian or just enjoy some great happy hour specials, head to Piola. You'll leave happy, full and not broke! Pin It Now!